The parts in the miniTn7 BioBrick toolkit are based on the excellent set of miniTn7 derivatives developed by Choi et al. (2005). All our derivatives contain the Tn7-L and Tn7-R ends, an antibiotic resistance gene flanked by FRTs and the prefix/suffix BioBrick-compatible multi-cloning site. Constructs will be available in derivatives of pUC18-Sfi, (high copy number, replicative in any E. coli strain), or derivatives of pUC18-R6KT (medium copy number, replicative only in E. coli strains expressing the pir gene). Specialized miniTn7 vectors containing promoters for gene expression or reporters for expression measurement will also be constructed. 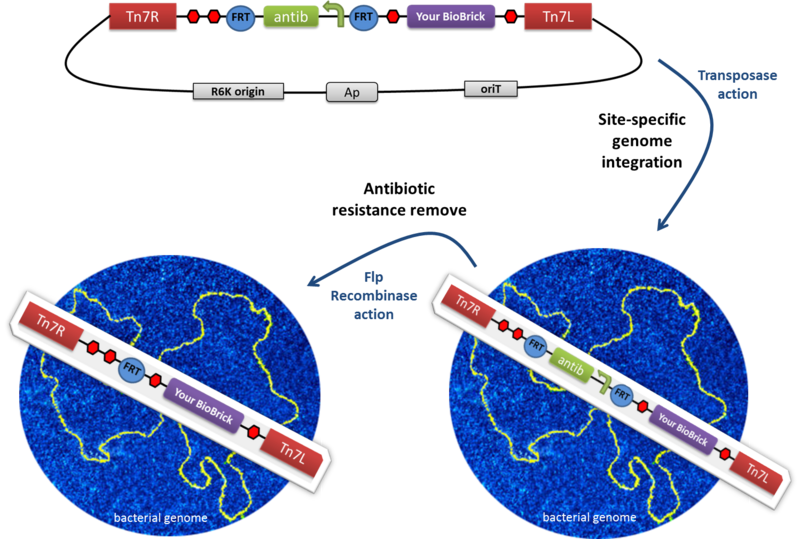 In addition, we will provide a portable attTn7 (Tn7 attachment site) to allow using the miniTn7 BioBrick toolkit in any organism as well as in plasmids. pUC18Sfi-miniTn7BB-Gm plasmid (BBa_K510000): this plasmid harbor the basic miniTn7 which may be used for integration of BioBricks in single copy into the genomes of non-enteric bacteria, in which it is non-replicative, at the conserved attTn7 site. pUC18R6KT-miniTn7BB-Gm plasmid (BBa_K510012): this plasmid may be used for transposition of BioBricks into the genome of any bacterium without the pir gen thanks to is R6K replication origin. attTn7 or Tn7 insertion site (BBa_K510022): recognition and insertion site of the Tn7 transposon and its synthetic derivatives. Because of the successful characterization of the modules that make all these plasmids, no functional problems are expected. David Caballero Pradas developed the miniTn7 BioBrick toolkit in the iGEM team UPO-Sevilla 2011.